Press the rear defogger and heated door mirror button to defog the rear window and mirrors when the power mode is in ON. When cleaning the inside of the rear window, be careful not to damage the heating wires and antenna line. 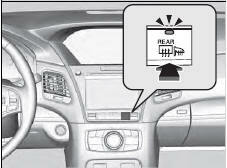 It is critical to wipe the window from side to side along the defogger heating wires and antenna line.